How can dissolved oxygen be measured using fluorescence? How long has this technology been in use? What is the expected life of the sensor? How often do the sensors need to be calibrated? Can the sensor be calibrated in the field? Are the sensors interchangeable, or do the sensors have to remain with a specific analyzer? Will exposure to sunlight harm the sensor or shorten the life of the sensor? What is the difference between fluorescence and luminescence? What is the accuracy of the InsiteIG fluorescence DO system? What is the minimum flow required for the sensor to properly measure DO? Does the measuring area of the sensor need to remain moist, even when not in actual use? If the actual measuring area of the sensor is physically damaged, can this be repaired? Can the Insite DO systems be used in very low oxygen environments, such as anoxic and anaerobic zones? What are the main reasons to monitor and control DO in biological reactors? Does the InsiteIG fluorescence technology infringe on any U.S. patents? 1. How can dissolved oxygen be measured using fluorescence? A very specific energy wavelength is transmitted to a ruthenium compound immobilized in a sol-gel matrix. The ruthenium will absorb this energy, changing the outer electron's energy level. The electron will then collapse back to its original energy state, emitting the energy as a photon with a different specific wavelength. This is called "fluorescing". If the intensity of the transmitted wavelength is tightly controlled, the amount of fluorescing is both predictable and repeatable. 2. How long has this technology been in use? 3. What is the expected life of the sensor? 4. How often do the sensors need to be calibrated? 5. Can the sensor be calibrated in the field? 6. 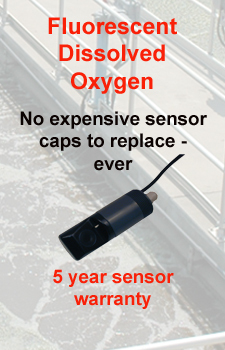 Are the sensors interchangeable, or do the sensors have to remain with a specific analyzer? 7. Will exposure to sunlight harm the sensor or shorten the life of the sensor? 8. What is the difference between fluorescence and luminescence? 9. What is the accuracy of the Insite fluorescence DO system? 10. What is the minimum flow required for the sensor to properly measure DO? 11. Does the measuring area of the sensor need to remain moist, even when not in actual use? 12. If the actual measuring area of the sensor is physically damaged, can this be repaired? 13. Can the Insite DO systems be used in very low oxygen environments, such as anoxic and anaerobic zones? 14. What are the main reasons to monitor and control DO in biological reactors? While there are almost as many specific reasons as there are treatment facilities, they generally fall into one of three general areas. 1. Reduce the amount of power required to run the blowers. This in turn will significantly reduce plant costs. 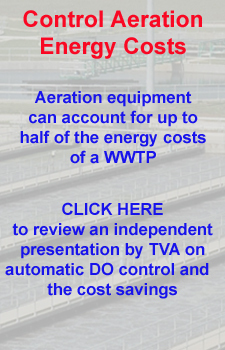 In general, up to 70% of a facility's power consumption is for aeration. An industry association estimates that the average treatment facility could save up to 30% by automatically controlling aeration. 2. Optimize the conditions in the basins to achieve the correct microbiological mix. This is especially important in BNR facilities.